Pretty soon homework will be mounting and the window between racing home from work or soccer practice to make dinner will be closing, but I urge everyone to please try to remember the madness is the goal. I know that feeling, it’s rough, but trust me, these crazed moments are fleeting, and they will not last forever. Hannah cheering me at my first Ironman, Louisville, 2008. 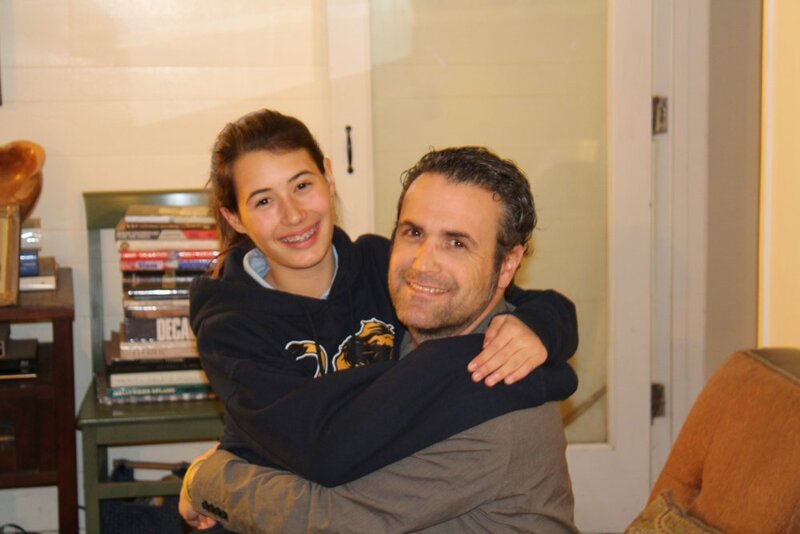 There’s a place in my chest that expands and collapses infinitely when I think about my step-daughter, Hannah. It’s the parent organ. It sits just to the right of my heart and slightly above my stomach. I always thought I would develop it one day, but not at all how I did. Three days after I turned twenty five years old I fell in love with a man who was nearly thirty five, divorced, (twice), and the father to a five year old girl named, Hannah. His name was Marion, and even though his life resume looked pretty daunting on paper, I knew he was the guy for me. Even though I was barely an adult myself, I knew what my life would look like and feel like if I pursued my feelings for Marion; hard, but perfect. I was presented with the rare opportunity to choose to be a parent. After careful thought and absolute ease, I jumped in headfirst. The night I met Hannah my parent organ sprouted, and my life has never been the same. My senses became more keenly aware of anything that she needed, I thought of her needs first before my own, and developed a sheath of steeled armor in order to protect her from everything harmful in the world. Humanity is everywhere; none of us are immune to broken hearts, disappointment, and failure. As our parents told us, “that’s all part of growing up”, but I thought the point of parenthood was to protect your kids from all of that, it isn’t. The point is to be there for them when they go through it. I am not perfect, I know I heaped hours of frustration onto Hannah over the years, but she could always count on me. I was always there, and will always be there. A couple of weeks ago I felt empty and couldn’t quite put my finger on what the problem was, and then it hit me, it was the first time in thirteen years when I wasn’t knee deep in “Back to School” craziness. Of course, Hannah has an incredible mother, and a dashing father, but I was the one who took the lead on all of her school activities, so to suddenly feel that void was tough. It hurt. At moments like this, it’s easy to forget sitting next to a crying nine-year old going over a tedious long-division problem while taking a call from work, and figuring out what to make for dinner, (an average Tuesday night for any parent), I could never imagine that there was a finish line, let alone reaching it, but there is. Even though those nights were ridiculously stressful and put years on me, I would wish them back in a second. I believe that a full, overwhelmed household with young eyeballs staring at you to make it all better and to provide every answer to every question is what it is all about. I think I answered most of Hannah’s questions over the years, but they weren’t all correct. Luckily, I had Jim and Cindy Walsh to help me out along the way. Beverly Hills 90210 re-runs were a priceless parenting resource. Still, I tried my best to be my best for her, and I am still trying. Hannah’s first day of college is around the corner, but she won’t need me, or her mom or dad to drive or walk her to class, she’ll do it on her own. It’s time for all of us all to move on to the next part of our lives; we’re ready, wistful, but ready.